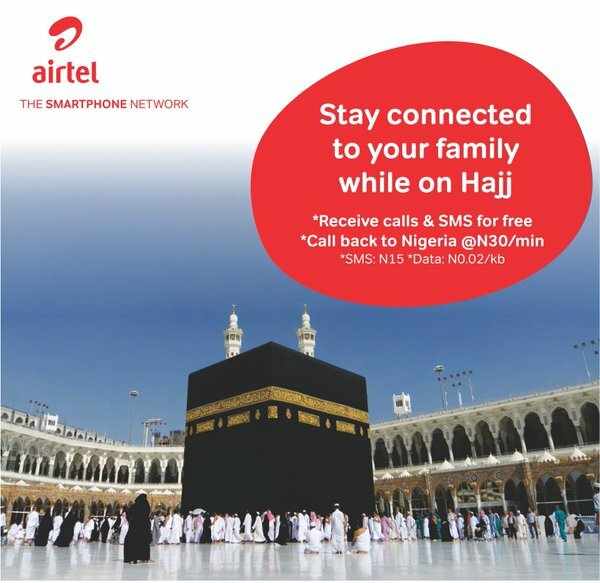 In a bid to make this year's hajj an exciting one and also to keep pilgrims always connected to their families and loved ones back home, Nigerians travelling to Saudi Arabia for this year’s Hajj are in for an exciting time as leading telecoms operator, Airtel Nigeria, is offering Hajj pilgrims free incoming calls and discounted rates on out-going calls, SMS and data. The new offer which known as the "Airtel Hajj Promo" is valid until Friday, 30th September, 2016 and its aimed at empowering pilgrims to stay connected with their families and loved ones by providing huge discount on roaming tariffs. 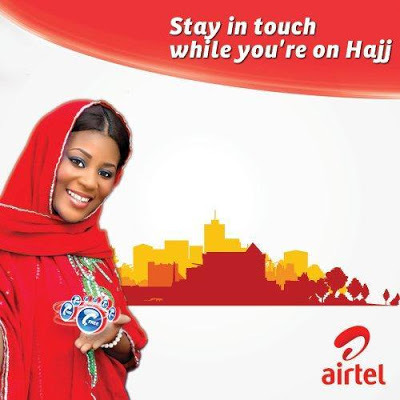 With this "Airtel hajj Promo" offer, pilgrims on the Airtel network will be able to make calls to any Network in Nigeria and also to any local Saudi Arabia number at the rate of just N30 per minute and also send SMS to any destination at the rate of N20 per SMS. Aside that, incoming calls and SMS will be free which means that pilgrims won't pay roaming charges on incoming calls or text messages and they will also enjoy data rate of just 2k/kB. Another good thing about this promo is that it is available to both prepaid and postpaid customers and also doesn't require any code to opt in. To enjoy this offer as a prepaid customer, what you have to do is to make sure you load sufficient airtime on your phone and also make sure you associate your Airtel line with either Zain or STC network once you arrive Saudi. And as for the postpaid customers, to enjoy this offer make sure you active roaming on your line before you leave Nigeria and also make sure you associate your line with either Zain or STC once your arrive Saudi Arabia. Recharging of airtime on your line has also been made very easy as you can Ask your relations in Nigeria to send you recharge pin and load the pin by dialling *126*PIN# or by using other top up medium such as though your bank, mobile app among others. Note that calls other international destinations will be charged at the normal roaming rate and as I said earlier this offer is valid until 30th of September 2016 and it is aimed at keeping pilgrims connected to their loved ones even while far away.